Sergeants D-Day is a unique gaming experience with simple, elegant mechanics that make it easy to get to the fun quickly. Card driven action means no unlucky handful of dice rolls dictate the outcome, all results good or bad are directly controlled by a players Action deck. Cards make the action phases variable (and provide random surprise events), while other cards in each player’s hand offer the challenges of making the best choices and their results. So, a game of D-Day is never routine and provides a new experience each time you play it. Welcome to the war soldier! Playing Sergeants is a gripping experience of move and counter move. It starts with the selection of your Squad — choosing a balance of leadership, firepower, and skill — and continues with your choice of actions during gameplay. You lead your soldiers as they sight the enemy, take rapid shots and dash to cover. If your soldiers are skilled enough, it's possible they can remain unseen, closing to point-blank range and into devastating hand-to-hand combat. You drive your men to accomplish your orders for the current mission, filled with unexpected events and determined opponents. Sergeants D-Day is easy to play but challenging to master. Four main Action categories include: Move, Shoot, Look and Hide. While these may sound simple, each action has many different applications. Choosing the right action at the right time can decide between the gutsy capture of a critical mission objective or the devastating loss of a valued soldier. These actions are built directly into the play decks, map board, and story deck. Best of all, you don’t have to look up anything in charts, because those four actions appear whenever and wherever they are needed. Likewise, each specific Soldier has his own Solider card, which translates how he can perform the actions. 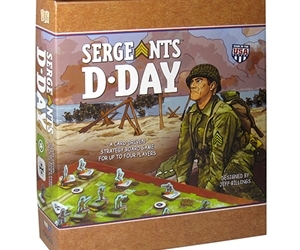 Sergeants D-Day Starter Set includes everything to play right out of the box. On the night of June 6th, 1944 two US Airborne divisions dropped into Normandy. The operation was well planned, but a night drop while under heavy fire from the German flak cannons, made it a disaster. Very few soldiers made it to their landing zones. Many were far off target and landed in flooded areas, woods or even in the ocean. The most formidable assault force of its time became scattered across France on the night winds. In Sergeants D-Day, you take on the role of a squad leader and command either the US Airborne infantry or the German Wehrmacht defense forces during the early Allied invasion. Sergeants D-Day recreates exciting World War II battles from small squad skirmish engagements to platoon level conflicts. Select and equip your soldiers, pick up your orders, plan your avenue of attack, and complete your mission.